WikiLeaks has published two classified documents revealing details of a EU plan for military intervention to curb the influx of migrants from Libya, and an information strategy to “facilitate expectation management” and avert reputation risks. 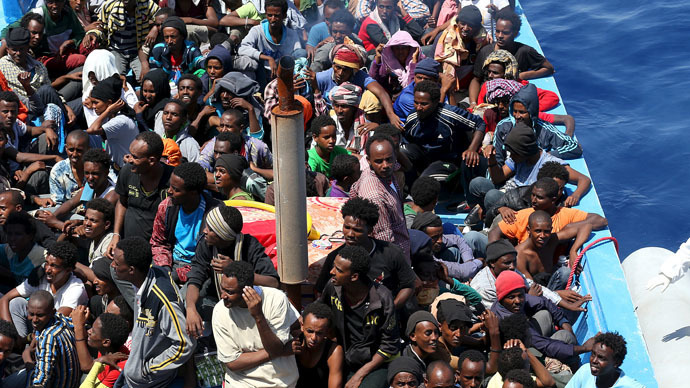 The European Union foreign ministers agreed to form a naval mission in the Mediterranean Sea targeting gangs smuggling refugees from Libya to Europe on May 18. One of the classified documents published by WikiLeaks on Monday reveals details of the planned year-long military operation against human traffickers. The 11-page document, drafted by the EU defense chiefs, outlines plans to destroy vessels along the Libyan coast as well as target transport networks and infrastructure within Libya’s borders. The second, 6-page EU Politico-Military Group advice paper on the military intervention lists recommendations on tackling human trafficking networks in the Mediterranean and outlines propaganda initiatives to sell the military option to the public. In this context, the European Union Military Committee (EUMC) highlights the need to create an information exchange and the “coordination of the use of military assets” between partners supported by Brussels (inter alia EEAS [European External Action Service] Single Intelligence Analysis Capacity – SIAC). “The threat to the force should be acknowledged, especially during activities such as boarding and when operating on land or in proximity to an unsecured coastline, or during interaction with non-seaworthy vessels. The potential presence of hostile forces, extremists or terrorists such as Da'esh [ISIS] should also be taken into consideration,” the document highlights. While the classified material acknowledges the main goal of the operation is fighting traffickers, and not preventing the loss of human life, the EU Politico-Military Group advice (PMG) paper recognized that search and rescue, “while not part of the core mandate of the operation”, should be administered according to international law.